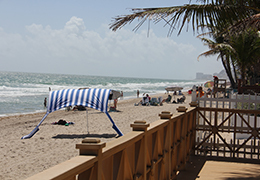 Sun Sail Cabana® will give you lots of open shaded area all day long. Way More Shade than that old umbrella. 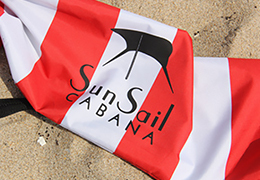 Sun Sail Cabana®– The Latest in Beach Shade Cabanas! 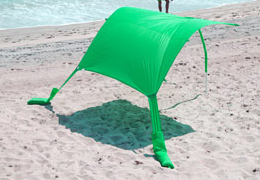 The Latest in Beach Shade Cabanas! Your personal Beach Oasis is waiting for you! Our new Sun Sail Cabana® is very Light weight, and easy to carry, Quick and easy to set up, and to take down. Your Sun Sail Cabana® comes with a large carrying bag that can also hold other items like your Beach Towels. All of our Sun Sail Cabana® fabrics are made of a light weight machine washable Micro Fiber Polyester, in a choice of colors. DON’T BE FOOLED BY IMITATIONS; OUR PRODUCT IS THE ORIGINAL AND USUALLY SELLS FOR LESS THAN THE COPYCATS. Your new Sun Sail Cabana® will Sail in the slightest breeze, and in very windy conditions without the worry of it being blown away. The new design allows the flexible adjustable pole to bend with the wind, and can be easily raised for maximum allowance of breeze, or lowered to keep the cool breeze at a minimum, you have total control over your comfort. Your Sun Sail Cabana® is made to be very fluid and not stiff like the old fashioned Beach Umbrellas…….watch it float, sail, and move like the ocean waves………..it truly is a work of art, and alive with movement. We Will Be Happy To Take Your Order Over The Phone. The rear poles should ONLY be used on non-windy days. If they are used on windy days, they could damage the cabana and void the warranty. The front, center pole is adjustable. It should be raised higher on less windy days and lowered on high wind days to allow enough wind in to fill the sail (like that of a sail boat) and create the shade. Having this pole in the wrong position could cause the cabana to not function correctly; having this pole raised too high on strong wind days could damage the cabana.